It can seem like the Wii U eShop gets the most attention in the 'Nindie' stakes, which is certainly the case. Nevertheless, there are still some highly promising downloads on the way to the 3DS, with plenty of life in the portable yet. One such example is Gunslugs 2, originally developed by Orangepixel - released on smart devices and PC - and now being brought to the 3DS in partnership with Engine Software. The latter is becoming prolific not only in releasing quality titles like Proun+, but also in supporting other developers in bringing their games to Nintendo hardware. For the 3DS, in particular, that's hugely important. 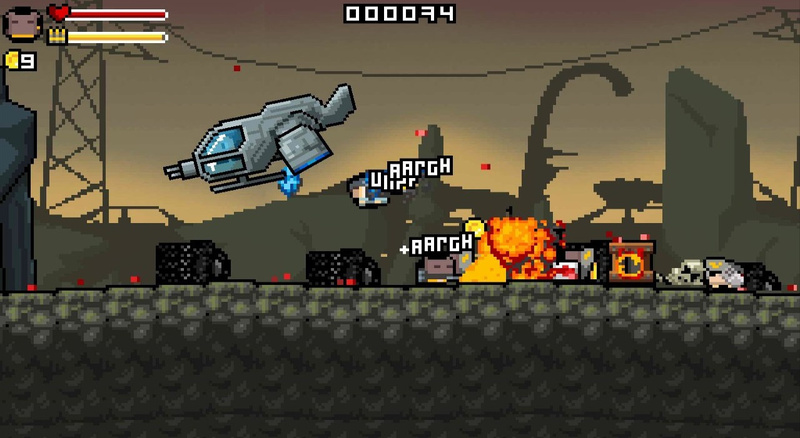 With an old-school pixel-based approach fused with randomly generated levels, Gunslugs 2 looks like rather chaotic fun. We caught up Orangepixel's Pascal Bestebroer and Engine Software's Ivo Wubbels to learn more about it and to ask the most important question - what about Gunslugs 1? First of all, can you introduce yourselves and clarify your roles in producing the game? Pascal: Hi! I'm Pascal, indie developer creating games under the Orangepixel label, and my role is creator of Gunslugs 2! Ivo: Hello there! I am Ivo, founder of indie developer Engine Software. Currently we are teaming up with other indie developers to bring their content to other platforms. We are working on several cool games, while most will hit Nintendo platforms as well. For Gunslugs 2 I was lucky to have some time to do the conversion mostly myself, so doing programming instead of the business stuff. We should probably start with an obvious question to clear it up - what about Gunslugs 1 on 3DS? Ivo:We think Gunslugs 2 is the best of the series, so we thought this is the version most players really want to play on the Nintendo 3DS first. But if the players love it, why not release the first game as well? Maybe for a good value price? Maybe add a poll on the website? Would you be keen to play the original Gunslugs on 3DS? 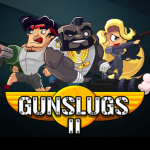 Can you introduce us to Gunslugs 2, with an overall summary or pitch for the game? Pascal: Oldschool arcade action game with a lot of chaos, shooting, and procedurally generated levels. Ivo: It does remind me on the good old days when we played game on MSX and arcade. So that's why I liked it so much! This has previously been on a whole host of platforms, at what point did the process start to bring it to 3DS? Ivo: Well we were not involved in doing the other platforms, but once I suggested Pascal we could take care of the Nintendo 3DS port, he kept asking when it would be ready. And yes, it does help we're both from the Netherlands. We're intrigued by the idea of a Story Mode with randomly generated levels. Though this is an idea featured more and more in gaming, can you explain how this'll work for the player? Pascal: In short, it means every game plays different, so big replay value. The worlds are made up from "outside" areas and building-areas. Every building is different and generated randomly when you play the game, same with the enemy placement in the outside areas. Can you tell us more about the Daily Challenges, and talk a little about whether this was a challenging feature to implement on 3DS? Ivo: Well as a player I can say those challenge are pretty hard. The most difficult task to get it on 3DS was for sure trying to complete those levels while testing! Are we right in saying this is single-player only, or is there co-op? Ivo: Well I think if the game does well on 3DS, we may come up with an co-op update sooner or later. The visual style is naturally very striking; this perhaps goes back to the first game, but what was behind that design decision? Pascal: The first game was a bit more "dirty" when it came to the use of colours and graphics, more raw. Gunslugs 2 cleans all that up a bit and things are more brighter this time around. The world graphics are using a lot of fairly bright colours. I guess I was just in a very good mood when making the game! How important is Gavin Harrison's music in striking the right tone for this game? Pascal: Gavin has become my partner in crime. We always take time to figure out the right type of music that should go with the action you see on the game. One of the important things with the Gunslugs music (both this and Gunslugs 1) was striking that 80's action-movie chord. You've confirmed stereoscopic 3D for the 3DS version. How important is this effect for immersion in the game, and will it have a solid 30 or 60fps performance with 3D on and off? Ivo: Performance isn't the biggest issue here, the game runs pretty good in 3D. However adding too much 3D effects only break the game. So we decided not to do that. I really think the 3D effects are just right in this game! Are there any other 3DS-specific features? Ivo: Well as you may have read correctly we may consider future updates! As this title has been on platforms such as PC, are there any plans to bring it to Wii U? What made you choose the 3DS first? Ivo: 3DS has been our main expertise for years, so a logical first step. And ok, we are doing Terraria for Wii U, so we know that system pretty good too, but we'll see on Gunslugs, you never know. Are you confident that this game will connect with the 3DS eShop audience? Pascal: I have had a lot of requests from people playing my games on smartphones to get my stuff on a 3DS. I think there is a lot of room for these "oldschool" arcade games on the eShop. Ivo: I do hope so. After releasing several games on eShop last year I know how difficult it is to judge who is playing our games on 3DS, but I really do think there are a lot of players waiting for retro type of games like Gunslugs. Are you planning future collaborations between Engine Software and OrangePixel, or does either studio have more Nintendo plans on the horizon? Pascal: I'm in! .. I say that a lot don't I? It probably all depends on how Gunslugs 2 does, I think the collaboration went fairly smoothly, so if Engine Software is up for it! Would you like to share a final message with our readers? 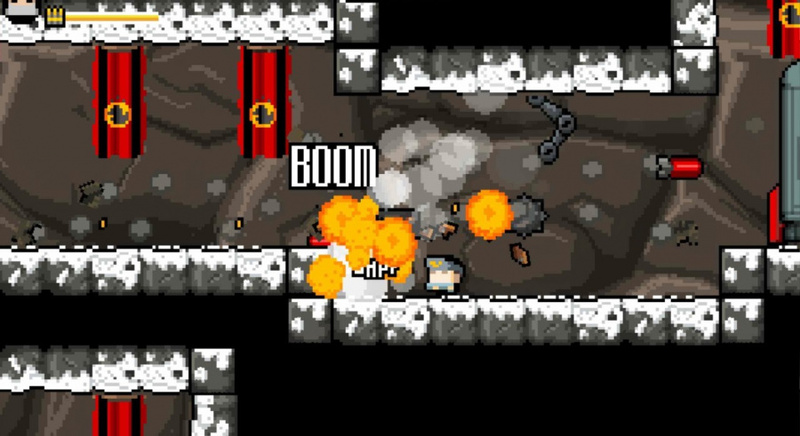 Pascal: Go grab Gunslugs 2 in October! Ivo: If you can't wait until October, just pick up Proun+ first! But that's just kidding, I would say keep also an eye on our future productions as we may have some very nice surprises coming up! We'd like to thank Pascal and Ivo for their time. looks like a cute metal slug of sorts. i'd check it out on the 3ds for a fair price. I'll buy both if they came to the Eshop. They look fun! @Soren It's a perfectly fitting answer in all cases above, work harder on your English at school! But kidding aside, he's just saying he's ready and willing to participate in the stuff they're asked about - or however I should explain it, English is not my 1st language. @Spideron Are you saying English isn't his first language? @ThomasBW84 Ok. Thanks for clearing that up. Sometimes it's hard to understand someone when English is their second language. Pretty interesting, however it would be nice to get both local and online co-op working. Worth buying for the soundtrack alone! @Spideron Oh, sorry about that. I misunderstood you. But I still think it sound kinda weird, though. The video temps me though I am not a huge handheld gamer really as usually when I am able to play games, I am home and I prefer the console. However, I will pick up my 3DS from time to time for good games. This will do well on the eShop I think. It has the simple style and appeal that Nintendo fans like. This looks excellent I think it'll do very well on the eShop. I just hope its reasonably priced and yes, I will be picking this up. Guys, what do you think is a reasonable pricepoint? I see several remarks about this. We haven't set the final pricepoint yet, so feel free to let us know what feels right. @EngineSoftware - In a perfect world I'd say $2 since that's the price on mobile. But I know the markets are different and Nintendo takes a chunk. @Orangepascal Alright, I get where you're coming from. Thanks for answering my question. All I'm saying is that it better be the same price as other versions.